The vacant lot across the side street has just been marked for subdividing, not into two lots, but, it appears, into FOUR lots. I am sick about this. The owner of the development assured us that they weren't going to allow this anymore, and in fact, would not provide water connections for more than one house per lot. Hmmpf! This lot is owned by a relative of the owners. There is no way that we will have enough water in this colonia to support one house on each lot, much less four. I'm sure that the electrical lines aren't sufficient to provide power to so many houses either. Then there is also the fact that we have been told that this side of the colonia has never been hooked up to the sewage/septic system and that all of our waste water goes directly into the creek. 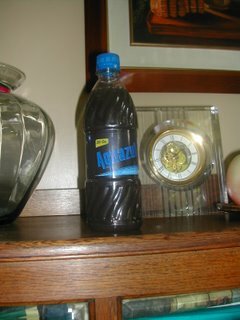 I still have my bottle of agua potable (potable water). I think I'll show it to all the people who come to look at the property. That is not coke! That is water straight out of the faucet. We finally received rain last night − a nice slow drizzle for a few hours. Today is cloudy and it appears that we might get some more rain. Right after it started raining last night, the air smelled so clean and fresh, and the temperature dropped noticeably. It was wonderful! The first time I went to Casa Toni, I thought that the store must have just recently changed locations. 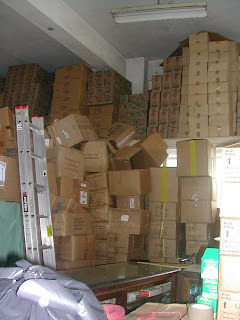 The second time I thought that they must periodically receive very large shipments and have no place to store them. 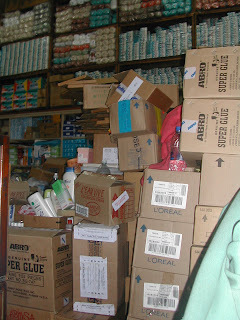 Now, having more experience, I know that the store always looks like this. This photo shows what you see as you come in the side door. The front door seems to be impassable now. 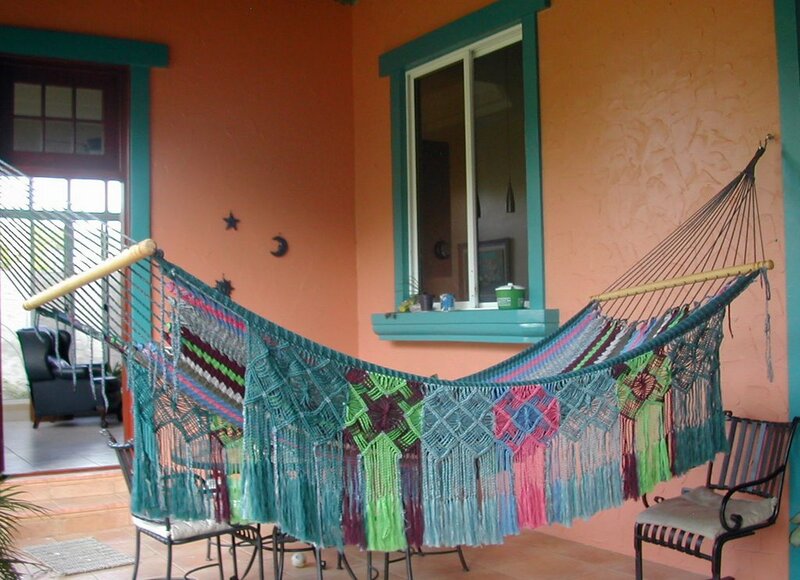 Recently one of our Honduras Living discussion group members was looking for yarn and I suggested that she try Casa Toni. It turns out that my recommendation was wrong. They sell crochet thread but not yarn. Looking at these pictures, I hope Sharon forgives me for the bad information. Those skeins at the top of the shelves look like yarn, don't they? Who on earth knows what they sell here?! After her trip, Sharon wrote to say that Casa Toni was "complete chaos!" I chuckled to myself, having forgotten what the store looked like. Just another one of those things that you somehow get used to. After she mentioned that, I thought the pictures might be interesting to you. As far as I can tell, they sell fishing tackle type items, crochet thread, hair dye, personal products such as shampoo and deodorant and a few nuts and bolts hardware-type things. When I need crochet thread, I go to Casa Toni because they have fine and normal (#10) sizes and lots of colors, although I usually stick to white or cream. How are their prices? I have no idea. Based on the crowd, I think they must be pretty good. 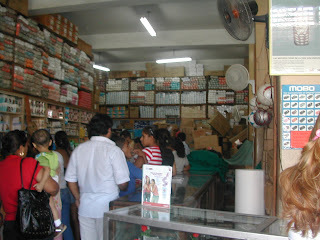 Casa Toni is one of those old "mom and pop" stores that has found its highly unusual niche in La Ceiba (fishing tackle, thread, and hair dye). The owners are very nice people. El señor Toni doesn't know this, but we have him to thank for our St. Augustine lawn! He has an orange grove a little ways out of town covered with St. Augustine. He is a friend of a neighbor and the neighbor asked him if we could come to get some grass sprigs for our new garden a few years ago. When he said no problema, we jumped at the chance. 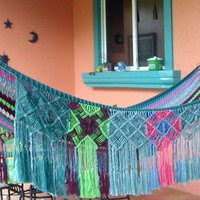 After a discussion in which I was talking about mantel para la cama ('tablecloth for the bed' − it was all I could think of to distinguish yarn from thread!) several ladies chimed in to help. El Jefe wasn't much help with this girlie stuff. It was determined that if you want yarn in La Ceiba, you should ask for lana (which means 'wool' and we all know that most yarn is not made of wool anymore, but that's the way it is). The discussion went similar to this Word Reference discussion, which I should have looked up before I went shopping. I ran down the street to see where the fire was coming from and then, of course, ran back to get the camera. I was planning to hose down the house and plants if it looked like it would come this way, but thankfully the wind was blowing the opposite direction and there were only vacant fields in its path. At first I thought that the construction workers must have been burning cement sacks and it got out of control, but the fire was behind the fence surrounding this property, so I don't think they started the fire. 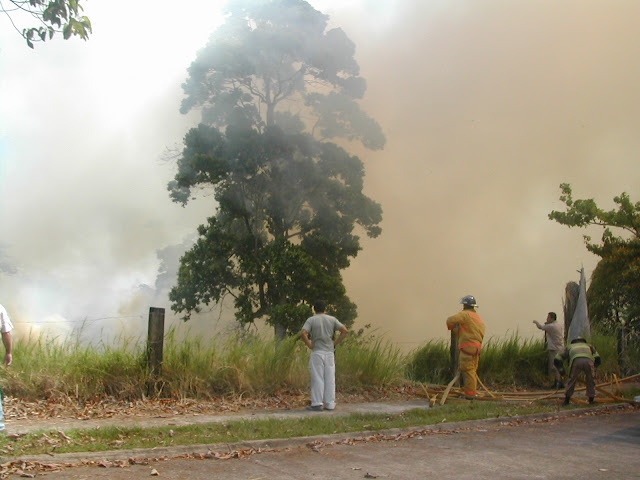 The fire may have been started by someone else burning trash behind one of the houses. In the past six weeks, we've only had about five minutes of rain. Everything is incredibly dry. This fire was northeast of our house. The wind blows from east to west almost all the time, but for the past couple of weeks, the wind has been blowing from the west. That was lucky because there are some houses directly to the west of where this fire started. It looks like evening because of the smoke, but it was only 9:30 a.m. on a bright, sunny morning. The fire trucks arrived amazingly fast, less than five minutes after I noticed the fire. One crew worked the fire from the west and this one from the south. I can't imagine how hot they must get in their fire uniforms. I had on a t-shirt and shorts and I was sweating. 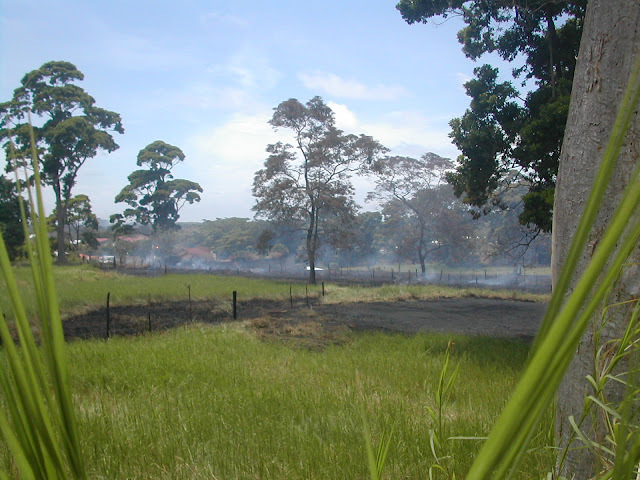 The fire was spreading very quickly across the dry grass fields. It looked like it might reach the farmhouse to the east before the fire fighters could put it out. You can see the fire fighters in the center by the fence line. The hose didn't look like it would have much effect on such a large fire, but they quickly got it under control. This photo is of some of the bystanders. One neighbor was complaining that the farm owner hadn't mowed their fields. I mentioned that the construction guard starts a fire almost every night and that it is very dangerous in this dry climate. Someone said they would tell the home owner. The television crew arrived a little too late. This is the aftermath about three hours later. That fence line is the same one where the fire fighters were working earlier. 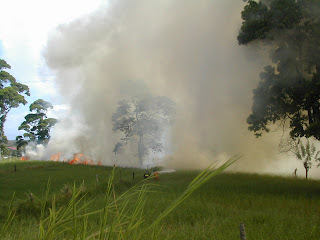 I hope the fire fighters will make sure that all those smoldering areas are completely out before they leave. This photo is looking to the east. The fire fighters are still working in this area. 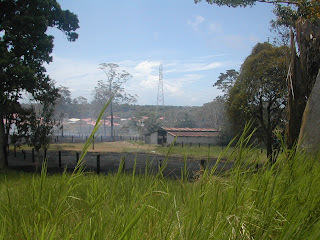 The fire got very close to the farm buildings. In the assimilation article, I mentioned "not blinking when a gun is fired in front of your house." This is an area in which I have failed to assimilate yet. For a few weeks, we were hearing gunshots, very close gunshots, nightly. At first it was making a nervous wreck out of me. After a while, I would just bring the dogs inside, try to go on with what I was doing, and ignore it. Not that it wasn't scaring me. It was more like when you hide your head under the covers, thinking the bogeyman won't find you there. Finally, on the verge of a nervous breakdown and thinking that it must be the guard at the construction near us shooting at raccoons or something, I asked (demanded) that El Jefe go talk to him. He did and was told that it was some well-to-do teens who visit another guard at another construction and enjoy shooting their dad's gun around the colonia. The guard didn't like it either. 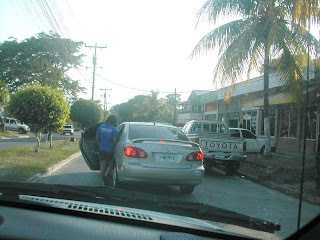 Moving down the road, El Jefe let the other guard know that it wasn't acceptable behavior. He also told him that when I'm home alone, I get very nervous hearing gunshots and that I might just shoot one of them by mistake thinking they were ladrones (robbers). "You know how women are." El Jefe planned also to go talk to the teens parents the next day, but guess what? After learning that their own lives might be in danger from an unstable gringa with a gun, they haven't been back since. I knew that a logical response of "This is dangerous. Someone could be killed or property could be damaged." would be met only with assurances that they are very careful, or don't worry, we only shoot up in the air, or "You can't tell us what to do." So the illogical response of "She might shoot back" seemed to work very well. Our front porch is the favorite hang out for six dogs, occasionally two chickens, and now, this not-so-handsome guy (or girl?). Why this toad would want to take his afternoon siesta among all the ruckus of the dogs is anyone's guess, but he/she seemed intent upon staying. Even after I brought the dogs inside, he hung around instead of making his escape while the coast was clear. Man, this guy is sooo fat that he looks like he's going to explode. He must be finding some good eats. 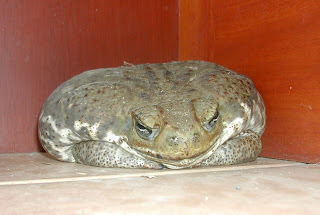 Is there such a thing as a balloon toad? I don't want to alarm you, but that looks like a bufo toad. We have them in Florida. The good news is, he eats mosquitoes and is generally harmless to humans, unless you touch him and put your hands to your mouth. The bad news is, he exudes a very poisonous substance through his skin, which is not harmful to touch, but if Chloe or the puppies pick him up in their mouths, it could be disastrous. If the dogs pick him up, you will have to hold their mouths open and flush with a strong stream of water. Then take them to the vet. My dog went into convulsions after picking one up. Humans have hallucinations after absorbing the substance through the skin or ingesting it. 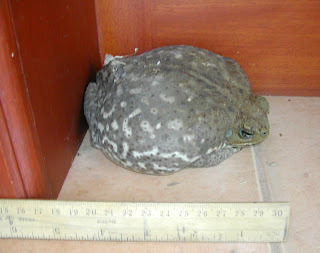 So I tried to do some research, but none of the photos show toads as fat as this one so I just wasn't sure. I wrote to Andrew Tillson-Willis, a toad expert in the UK. He immediately identified both this one and the one I posted a few months ago as Bufo marinus (Cane toad), a poisonous toad. Great. I read in this article, Danger - Giant Toads, that they are extremely dangerous to dogs. Now what? I don't know where the toad is now. How do I keep six dogs away from this toad? By the way, if you are interested in toads, or just want to see some great photos of toads, check out Andrew's site, Pollywog. He even has a toad forum. Whoops! I guess the camotes (sweet potatoes) are past their prime. I think I'll just plant them and see what happens. 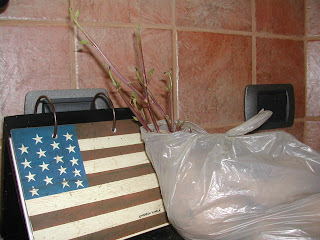 I wish I could find a really good variety of sweet potato to plant. The only variety I've found here in La Ceiba are yellow inside, not very flavorful, and the texture is often a bit stringy. I love sweet potatoes. I wonder if they would be more popular here if a better variety was available. Other than bananas, yuca (cassava), cabbage, mild chiles, and tomatoes, not many vegetables are staples in the basic Honduran diet. 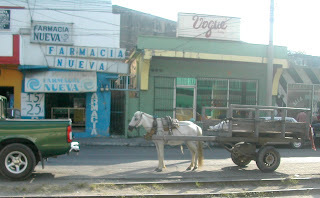 In fact, many of the other vegetables that are available in the market are imported from Guatemala. I've always wondered about this. I found an article the other day which helps to explain the lack of diversification, at least in one small town called Agua Amarilla. Mangoes and Pineapple - Yum! 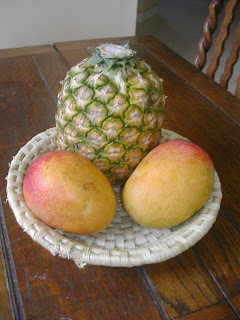 Mangoes, 7 lempiras each (US $0.37), pineapple, 15 lempiras (US $0.79). El Jefe says that pineapples used to be four for L.15. Is this the same president we had yesterday? 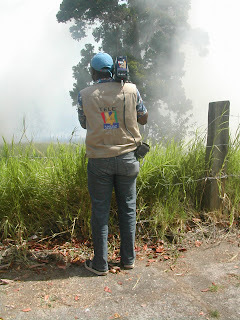 In the Day of the Journalist, the Government of the Republic (of Honduras) that is presided over by Mr. President José Manuel Zelaya Rosales, congratulates and recognizes the responsible and important labor of journalists, auditor and voice of the majority, guarantor of democratic freedom and meaningful support of all government that looks for integrated development for all Hondurans. Hondurans, help me out here. Have I translated this properly? Is he "hablando con pelos en la lengua"? Does that phrase fit this situation? I've never been quite sure what "hairy tongue" meant. 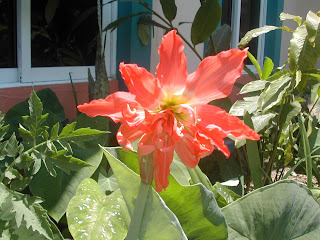 Readers Jamila and Suzy sent this photo taken on the island of Roatán, Honduras. Can someone tell me if that boy's body is riddled with bullet holes or is that just rust? Sorry, sorry, sorry! I couldn't resist. I'm sure that many people spent years and years fighting the bureaucracy to get this school crossing sign posted and I sincerely hope that it is helping to keep the children safe. *Tater tots: For the native Spanish-speakers, tater tots are grated potatoes shaped into little 1 inch balls and fried , similar to the hashed browned potatoes that Burger King sells at breakfast, but in a more rounded shape. Tot is a nickname for small children, tater is a slang word for potatoes, hence: tater tots. Honduras has taken the first step down that slippery slope I was talking about in "Oh, boo hoo, everyone is against me." "Honduran President Manuel Zelaya has ordered all private radio and television stations to broadcast government propaganda to counteract what he called unfair coverage of his administration." "We find ourselves obligated to make this decision to counteract the misinformation of the news media about our 17 months in office," Zelaya told a news conference. The fact is that people are not stupid. If Mel's administration was doing good things for the country, the people would know it and the press would report it. We wouldn't need him to tell us about it. He says that the media has created a climate of personal and business insecurity. He can't really be so naive to think that people will feel safer or that businesses will come to Honduras because the president commandeers the media and says so, can he? Some of the most recent information is that Zelaya's country house was fiber-optic wired by the near-bankrupt national telephone company at no charge to him. A few years ago, the former Honduran president made an address and all of our 80-plus cable TV channels were turned off until the address was finished. I'm wondering if these two daily hours are going to be like that, where people don't have a choice to watch or listen to anything else. El Colegio de Periodistas (organization of journalists) has asked him “muy respetuosamente” (very respectfully) to revoke his decision. Update May 25, 2007: President Zelaya's actions have the attention of potential business investors now. The story was picked up by Forbes, International Herald Tribune, NY Times, LA Times, and numerous other news agencies. If there is one thing that most of the world agrees upon, it is the importance of freedom of the media. 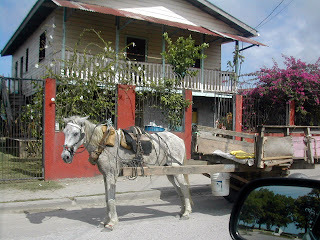 Random La Ceiba photo that has absolutely nothing to do with his article. 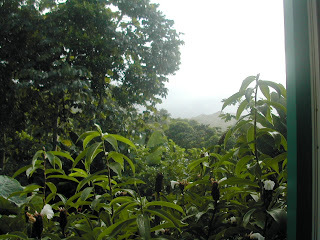 "The beauty of Honduras was not initially apparent," Tara recalled. "The extreme poverty was overwhelming, depressing and frightening. Nothing I had seen on television or read about could have prepared me for what I saw." One of many stories almost daily on the internet of U.S. Americans coming to Honduras to help the poverty stricken. Where do your socks come from? "Imports from Honduras alone jumped about 40 percent through February since the country implemented the agreement (CAFTA) last March and Alabama has lost more than one-thousand sock mill jobs since the trade deal was approved in July 2005." "estrada, a transvestite activist in honduras, was beaten by five men on april 20 while police officers encouraged the attackers and reportedly prevented others from coming to his aid, according to amnesty international...estrada was injured and has received no medical attention in police custody....he was jailed for attempted murder charge when he tried to defend himself while his attackers were set free..."
This is from a blog called "true peace is the presence of justice." It's subtitle is "freedom is when the people can speak...democracy is when the government listens..." How true. “In Canada and the United States, cyanide is no longer used [by Goldcorp subsidiaries], but over there [in Guatemala and Honduras] they still use it... What we need is solidarity among peoples." "Archaeologists working in Honduras have discovered an entombed human skeleton of an elite member of the ancient Maya Empire, which might help unravel some longstanding mysteries of the vanished culture." For more information about the Copan ruins, also see the national park site. Where does this pizza go? I happened to be the designated pizza traffic director in my colonia. Even El Jefe didn't know this. 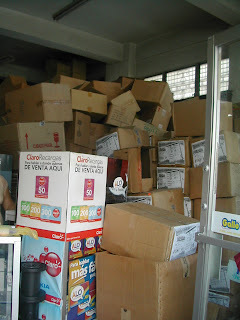 All three, Pizza Hut, Dominos, and Toto's, have requested assistance from La Gringa on various occasions. Not that I'm good at giving directions. In fact, I get nervous and forget how to say things like "go down" this street x blocks, so I end talking in choppy phrases instead of complete sentences. It's just that, unless it is their pizza, no one else will come to their door. That's what the pizza guys tell me. It's more like a game of charades, with me pointing (with my finger, not my chin) and driver guessing "Go left?," "Second house?" etc. It's fun, though. My vecinos (neighbors) don't even know that they have me to thank for getting their pizza while it's still hot. I really can't imagine how pizza deliverers can possibly find homes in the larger colonias. For the most part, there are no street signs, no addresses, and the "yellow house in the middle of the block" usually only narrows it down to two or three possibilities and who knows if you are on the right block to start with. These guys have a hard job. The small double doors to the left are for the migration office. There is no indication whatsoever that this is a government office. I just renewed my official Honduran residency card. Yes, I am a "legal." Although I'm sure it was a lot easier than it is for immigrants to the U.S., I'll have to say that getting this card took a lot of time, money, and effort so I really value it. Once a bank employee misplaced my card and suggested I come back the next day to see IF they found it. I sat down and said, "I'm not leaving until you find it." I don't know why this renewal always stresses me out, but it does. I guess it was the fact that the rules changed the first few times. I was never entirely sure where to go, or what documents they would ask for, or how many copies they would need. There's no website where you can go find out such things. And then there is always the chance that they'll spell my name or something wrong and it will take me 10-15 years to get it corrected, like some of the Hondurans I know who have just changed the name that they use because it is easier than getting their name changed on their ID card. Seriously. I know three people like this − I wonder how many there are? Foreign residents used to only have to renew every two years, but now it is every year for some reason. Probably the fees. I'll bet most residents would gladly pay double if they only had to do it every two years, especially since there are only three cities in the entire country where it can be done and it requires a minimum of two trips to get the new card. Every single year I have to take copies of my official Honduran documents down to the migration office to get the card. I don't know why they need copies of the same documents over and over again. Imagine the employee's time, not to mention filing space they would save, if only they could rely on the fact that the employee who issued my original card five years ago did actually see and file away copies of those official documents. It's kind of like if you had to prove every single year that you owned your car in order to get an annual license plate sticker. 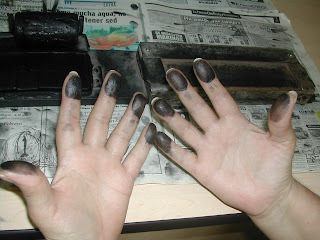 I had to be re-fingerprinted this year for some reason. They took fingerprints the first time and never asked for them again until now. Unlike for certain other Honduran documents, they don't use digital fingerprints. Yuck! Look at that ink! I also asked for and was granted a new photo. Wait! Before you start thinking that I was pouting because I didn't look "pretty" in my photo, I have to tell you that the photo was so distorted that I didn't look "human" in that photo. It appeared that the camera took a square photo which was then stretched to fit the rectangular space on the ID card. I looked like a potato head and you really couldn't even tell if I was a Mr. Potato Head or a Mrs. Potato Head. Seriously. Well, the clerk was kind enough to take a new photo and even showed it to me on the computer screen first. But when she gave me the card − same thing! At least with this one you can tell that I am definitely a Mrs. Potato Head. Anyway, I'm legal for yet another year and it feels good. I mentioned in the previous La Ceiba Carnaval article that I was surprised that there wasn't more information about it available on the internet, since it is one of Honduras' major mainland tourist attractions and it is supposedly the biggest carnaval (carnival) in Central America. Google apparently agreed with me because now a search for 'La Ceiba Carnaval' lists my flimsy article as the 4th and 5th entries out of 60,000 entries. 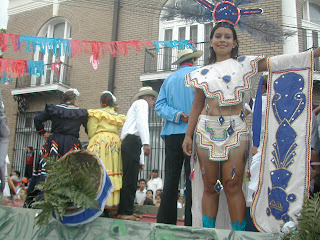 If you use the English spelling, 'La Ceiba Carnival,' my article shows up 8th and 9th out 21,700. I'm not trying to brag, really I'm not. I'm just trying to show that the marketing of this event is not going so well if my blogicito ranks so high. The "official Carnaval website" (in Spanish) (link removed as the website no longer exists) is now functional, for the most part. 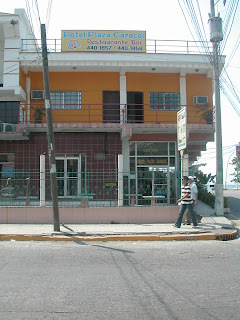 The information about hotels and restaurants is slim, so if you are coming to La Ceiba for carnival, a better site to check out is Honduras Tips, although some of that information is outdated. Actually, if you are coming for carnaval, I hope that you already have your hotel reservations, because this is one of the two times per year that the hotels do fill up. Actually, if the hotels fill up, then maybe they don't want to market it....Oh well, never mind, again. Today's news: No toxic African dust cloud coming. They say it hit Puerto Rico instead. Sorry about the false alarm. You can see how dry the plants look even after heavy watering last week. Some rain would be greatly appreciated. A giant cloud of toxic dust from the Sahara, Africa, is headed in a direct line toward Central America, especially the coast of Honduras, Nicaragua, and Belize. 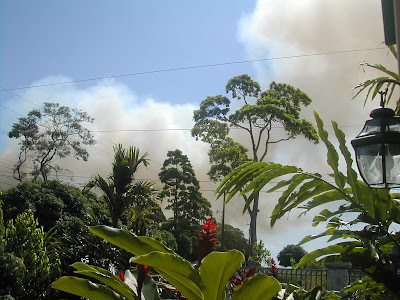 COPECO, Honduras' national emergency agency, recommends taking precautionary measures, such as not working outside. According to today's La Prensa, the cloud, moving at 20-30 km. per hour (12-19 miles per hour), currently measures 1,200 by 800 km. (746 by 497 miles). According to the US Meteorology Service, the cloud was over Venezuela on Friday, and will be over Honduras today and tomorrow. According to Central American experts, the cloud is carrying 2 parts per million of mercury originally from African mines as well as pesticides whose use is prohibited in developed countries but are frequently used in the north of Africa. They also mentioned that it will bring microorganisms which will cause respiratory problems, principally in the Caribbean region. The most impact will be in the coastal zone and it may leave a fine layer of reddish dust. In the same article, the head of Honduras' Meteorological Service said yesterday that there was no evidence that the cloud contains toxins. What's a person to believe? Trying to do some research on African dust, I found that this phenomenon of it coming to the Americas has been happening for years and is considered to be one of the causes of the destruction of the coral reefs of the Caribbean. 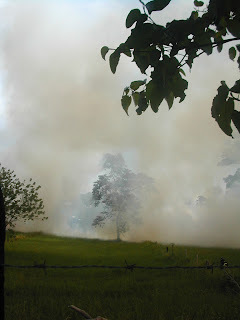 Below is a picture of an African dust cloud. Pretty impressive, huh? 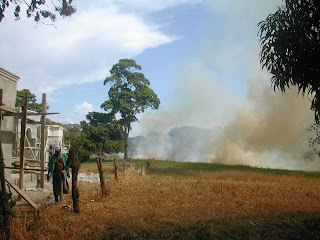 We've already been suffering from a smoky haze in Honduras for about a week and now this! I've had a mild headache and a slight sore throat for three days now. 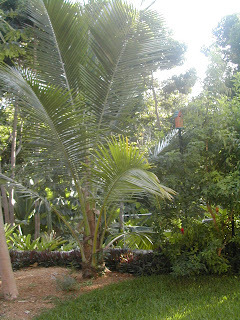 I never dreamed I'd have to worry about African pesticides contaminating my organic Honduran soil. CJ Jackson captured this excellent photo of two fruit bats drinking from a hummingbird feeder. Go to the Big Rock Utila site to see some of his other nice photos of flora and fauna on the island of Utila, Honduras. Here in La Ceiba, we get some kind of small bats swooping around at night to capture bugs, especially by the street lights. I'm never quick enough to even see them clearly, much less get a photo. Congratulations, CJ, on the great photo, and thanks to your Aunt Gail for letting me post it. This recipe is for a 1 1/2 quart ice cream freezer. Makes 1 1/2 quarts of the most delicious ice cream imaginable. Peel and slice a medium size ripe mango. Place 1 1/2 cups of pieces in blender and puree until smooth. You should have around 1 cup puree, más o menos (more or less). 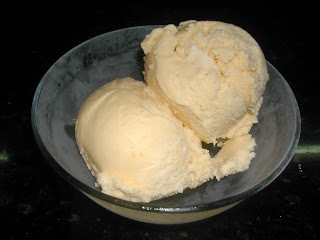 If you use a large mango, dice part of it and top your finished ice cream with the mango pieces. Yum. Beat eggs with wire whisk (not electric mixer) for 2 minutes. Gradually add sugar and continue beating until sugar is well blended, about 1 minute more. Stir in vanilla, mango puree, and cream. 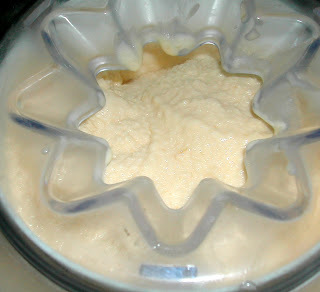 Stir in enough milk to fill your container to the proper level (5 cups total for a 1 1/2 quart Cuisinart ice cream maker). Chill mixture thoroughly before placing it in the ice cream maker. Freeze ice cream according to your machine's directions. Enjoy! 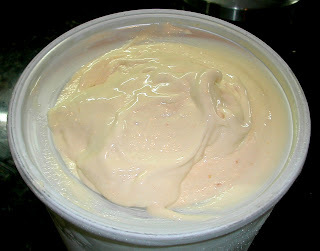 La Gringa's Papaya Ice Cream: Substitute approximately one cup of pureed ripe papaya for the mango. This is just as delicious as the mango. Hint: Papaya ice cream has the most beautiful color. Warning: This ice cream is a rich, high fat, high cholesterol treat. It is based on a Ben and Jerry's recipe, so you can't go wrong. You could fool around with the recipe and make it lower fat or vegan, but if you're going to have ice cream − my motto is go for the best! Don't be afraid to buy mangoes in your grocery store even though they may appear green and hard. They are picked here long before ripe and usually ripen quite nicely and sweetly if kept at room temperature. Avoid mangoes with bruises or holes as those sometimes indicate a more serious problem inside. When ripe, depending on the type, the skin can be yellowish, orangish, reddish, even greenish, or a combination of all of these colors. They should feel slightly firm with a little give when you give it a squeeze in your hand, kind of like a ripe peach (the taste is similar, too). 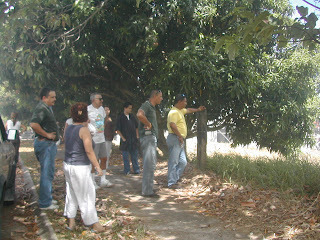 Some mangoes have long fibers near the pit. Discard those as they tend to get stringy in the ice cream. A ripe mango will keep in the fridge for several days, but like any other fruit, once it's ripe, it's best used within a day or two. 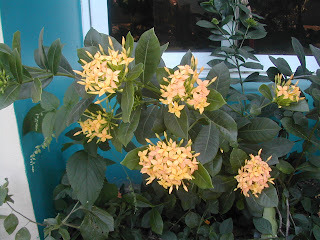 I awake to the cool breeze with the scent of jasmine blossoms wafting through the windows. After my personal maid brings my coffee and helps me to dress, the cook prepares my breakfast. After a leisurely breakfast and the newspaper, I go over the day's menu with cook. While it is still cool in the morning, I stroll around the garden, giving the gardener instructions on what he needs to attend to today. I also point out the flowers I would like cut for my daily fresh flower arrangements. 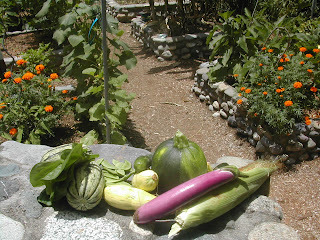 Rafael is completely converted to organic gardening and has thrown away his machete because he appreciates how much better everything looks when trimmed by hand. For fertilizer, his assistants collect fresh seaweed that has washed up along the shore. While I'm strolling the grounds, Paula, the laundress, places all the freshly laundered and ironed clothing away so as not to disturb me. Paula is a gem and I feel that all of my designer clothing will last years longer with her caring for them by hand. By then it is starting to warm up and I'm a little tired, so I lounge in the hammock and read while our other maid, Suyapa, prepares a fresh drink either with fruit picked from one of my many tropical fruit trees or iced tea with freshly picked lemons, lightly sweetened, just the way I like it. Suitably refreshed, I then go to check my email and spend a few productive minutes on the internet in which I answer all of my email and update my blogicito with fascinating, timely articles. Before I know it, it's lunchtime! Cook does a wonderful job preparing healthy, delicious, but low-fat meals always using seafood fresh from the ocean and fruits, vegetables, and herbs picked that very morning. I feel as if I am in a health spa every single day. After lunch I usually like to swim for a while in our Olympic size pool. The cabana boy is very attentive and the very second that I get out of the pool, he has a fresh towel and a cold cocktail ready for me. No one makes a piña colada like Javier. 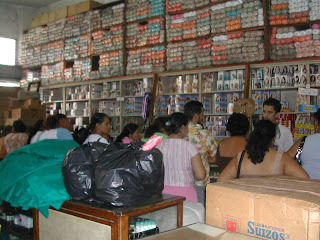 Some afternoons I go to town to shop in one of the many fine designer boutiques we have here in La Ceiba. I had to give up the Rolls because I thought it was just too pretentious for Honduras, but my driver has really grown to like the BMW. La Ceiba is a small town, so every now and then, Bob, our helicopter pilot, flies us to San Pedro for more serious shopping. It is a bit of an extravagance to keep Bob on staff, so he doubles as guard to keep the riffraff away and to confiscate the annoying cell phones of all visitors. Later in the afternoon, the housekeeper comes to tell me what she has accomplished today. Of course, her work is always impeccable. I never even have to check and her ability to schedule her work so that I am never disturbed is just beyond belief! Once, I did find a dust mote on my computer screen. She was severely chastised and I feel certain that it will never happen again. Trying to assimilate into the Honduras culture as best I can, I generally like to take a siesta in the afternoon, just to show the staff that I am one of the people. Of course, in this heat, it is easier to doze off if Javier is gently fanning me with a fresh cut palm leaf. 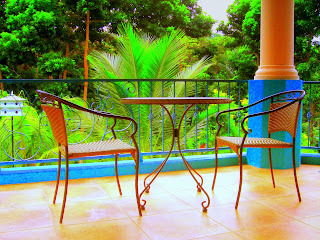 Evenings are generally spent chatting on the terraza with another cool, refreshing drink. Rafael's staff have surrounded the terraza with citronella and other beautiful insect-repelling plants so we never have to worry about mosquito bites. We generally go to bed early so that the staff can finish their work in peace on into the night. Occasionally we go to one of the many stimulating cultural events in town, but you know what that means! I'll have to sleep late the next morning and how on earth will I be able to get all my daily work done? The pictures are real. The story? Well .... what do you think? Aurelio Martinez is a Honduran musician of Garífuna descent. His video, Fiesta en Carnaval, with Yankee Col and La Vieja Escuela, was a semi-finalist for the official theme song of the La Ceiba Carnival. You can view it in my blogicito here. "The sung Garífuna language sounds like nothing you've heard before. And for good reason. 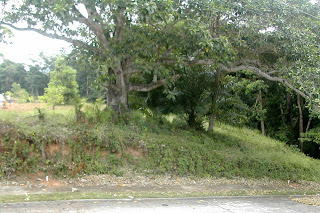 Garífuna is a unique creole mix of indigenous and African tongues. 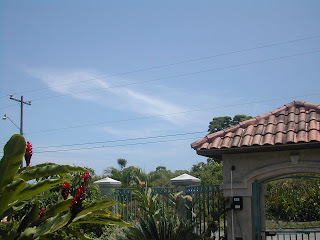 Several songs are set in clave rhythm, reflecting the Caribbean coastal Garífunas' intersection with Latin Central America. Half the songs are credited as "traditional." Martinez's international debut delivers a deeply satisfying and consistently superb set of songs that range from melancholy and langor to joyful uplift. --Afropop Worldwide"
You can also read more about Aurelio Martinez and listen to his music at Stonetree Records. Two of his CDs are available at ITunes and several videos from his concerts are on YouTube. And for everything you ever wanted to know about Aurelio Martinez, check out this Google search. He has been touring the U.S. and there is still time to catch him in San Fransisco May 15-17, and Salt Lake City May 18-19. We were watching the local La Ceiba news at lunch today. We have several local TV stations, believe it or not. They talk too fast for me to catch everything, but there were a couple of interesting things. 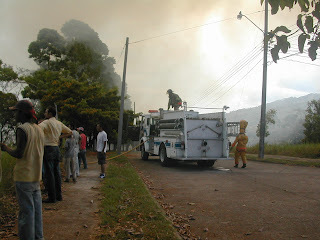 One program interviewed Henry Stanley, Commandante de los Bomberos (Fire Chief) of La Ceiba. I was interested in this after reading the "smoke" weather forecast the other day. He said that in the past few weeks, they have had to attend to a minimum of three fires per day and sometimes as many as eight to nine per day. He chastised people for being careless with fires, saying they need to think about the damage they might do to other people. He also spoke about the damage that people are doing to the environment and the countless animals that are killed when these fires get out of control. I've seen him interviewed before and have read several newspaper articles in which he was quoted. I'm very impressed with him. 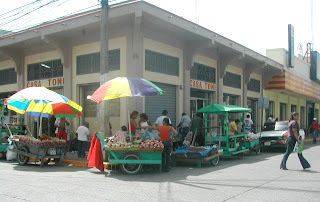 Another station had a viewer call in complaining about some hanky-panky going on in the municipalidad (municipal government) where employees are selling municipal property under the table. The commentator starting going on about various other misdeeds of the municipalidad. He said (don't know if this is true or not) that even our water in the Cangrejal River is a concession from someone/some company in Tegucigalpa. I don't know how this could be, since it is my understanding that all the creeks, rivers, and beaches in Honduras belong to the public − supposedly. Maybe I'm being naive. Then the host made the comment that "the only thing the municipalidad hasn't given away, stolen, or sold to others is the air that we breathe, and who knows, maybe soon they'll be telling us we have to pay for that, too!" I'm not the only one feeling sorry for myself lately. Honduran President Mel Zelaya says that everyone is against him. “Critican absolutamente todo como si este país estuviera en ruinas, no quieren a Honduras, no quieren a los hondureños, actúan sólo por intereses particulares o políticos”, fustigó. "They criticize absolutely everything as if this country was in ruins, they don't love Honduras, they don't love the Honduran people, they act only for private and political interests," he lashed out. He says that the media is the only reason why Hondurans don't feel safe. If only they wouldn't write about all the kidnappings and murders, we would all be dumb and happy and think that he's doing a great job. When pressed about it, he says he just wants to censor the gruesome photos. While I agree that the photos are often excessive, any step toward censoring the media is a step down a slippery slope. Next I suppose he will say that the only reason that 95% of the Honduran people believe the government is corrupt is because the media writes about it. A couple of weeks ago, he compared himself to Christ, because, he said, there are sectors who only want to crucify him, despite all the good he has done. Honduran blogger Shabaj of the Claro y Pelado blog thinks that Mel owes the Honduran public an apology for this one. The other day he decided he wanted to fly an F-5 jet, so at a cost of somewhere around L. 90,000 in fuel alone (U.S. $4,760), he did. Of course he was blasted by the press. Ex-commander of the Honduran Air Force Roberto Mendoza Garay said that Mel put himself, the jet, and any other air traffic in the vicinity in danger. The commander said, "We can replace the president, we can't replace this jet because it's too expensive." Ha ha! His latest statement which made the headlines was "I don't govern." That's not something a politician usually admits. He says that power groups "have hijacked the country." I think most Hondurans have known for a long time that power groups hijacked the country many years ago. It is just that now, it seems the power groups may be against Mel. Reader Gail from Key Largo mentioned that she download Wátina, a Garífuna CD by Andy Palacio and the Garífuna Collective. I checked it out on Cumbancha.com and spent two hours listening. Oh, I love this kind of music! I'm not a music buff. I couldn't participate in an intelligent conversation about English-language music, much less Garífuna. I only know what I like. Even though I can't understand the words, this music really speaks to me. "The booklet that comes with it is worth the cd price in itself. Beautiful history, the lyrics, an inunderstandable dying language. Yet, you can understand what is being said, especially with the English translation. Simple texts, sometimes big things don't need much words. Put this on, have a beer, close your eyes, move to the tropics. This is fine fine music." Andy Palacio is from Belize. You can see his Myspace and read more about him as well as listen to and buy his music at Cumbancha.com, Amazon.com, and several other sites on the internet. ITunes has Wátina and two other Andy Palacios CDs and YouTube has several videos. For even more, check out the links in this Google search. I would really be interested in what you true music buffs (Bob, David, others?) think about this music. Mañana (meaning some day other than today, haha), I'm going to tell you about a Honduran Garífuna singer who I like a lot, too. P.S. for Gail: Buy that CD! I'll buy it from you when you come. And you see that empty parking space, don't you! Don't return phone calls because you don't want to spend your minutes. Park in the middle of the street because you only need to run into the store for a few things. Honk outside neighbors homes to get their attention instead of going to their gate. Don't even blink when a gun is fired in front of your house. Eat mayonnaise on your hamburgers because it is just too much trouble to ask for mustard. Say "Si Dios quiere" (If God wills it) if you aren't sure that you want to commit to something. Keep candles and lighters in every room for when the power goes out. Keep buckets of water for emergency flushing. Carry your own toilet paper at all times. Buy a guard dog and a gun. Never, ever say "I'm sorry" or "you're welcome." Dress up to go to Pizza Hut. How about it? Do you ex-patriates have anything to add to the list? "I don't want them to take him, he is my son"